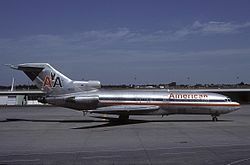 American Airlines flight 383, a Boeing 727, was a non-stop flight from LaGuardia Airport (New York) to the Greater Cincinnati Airport. The airplane departed New York at 5:38 pm and was scheduled to arrive in Cincinnati around 7:00 pm. The plane was flown by veteran pilot, Captain Dan Teelin, who had been with American Airlines for over 10 years and, Captain William J. O’Neil, who was being upgraded to captain on the 727. It was a routine flight and at 6:57 pm, the flight crew notified Cincinnati it was on its final approach. The tower notified Captain Teelin that there was rain in the area, and the captain relayed that the visibility was getting bad. The tower told the crew that the runway lights were on high, but the airplane crashed into a wooded hillside two miles north of the runway 5 seconds later. The plane broke apart and went up in flames. There were two survivors in the front of the plane and two in the back, but the other 58 passengers perished. Becky Riddle, “Crash of AA Flight 383,” ExploreKYHistory, accessed April 19, 2019, https://explorekyhistory.ky.gov/items/show/704.